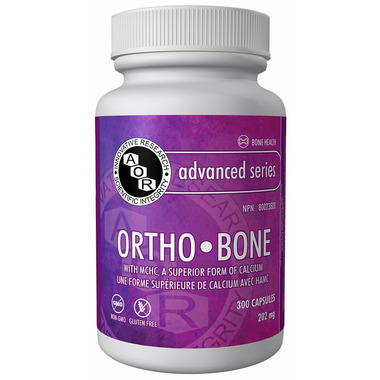 AOR OrthoBone is a multi-vitamin and mineral supplement which contains ingredients that help in the development and maintenance of healthy bones and teeth. It features calcium derived from microcrystalline hydroxyapatite complex (MCHC), a lyophilized extract of bovine bone derived from New-Zealand pasture-fed, free-range livestock not subjected to routine antibiotics or rBGH. When combined with a healthy diet and regular exercise, AOR OrthoBone may reduce the risk of developing osteoporosis. AOR OrthoBone also provides folate and Vitamin B12 which help to form red blood cells. Directions: Adult Dosage: Take up to 10 capsules daily with meals, or as directed by a qualified health care practitioner. Take a few hours before or after taking other medications. A definite plus to take when you suffer from osteoporosis. I know I can trust AOR products to be healthy and free of additives. I used their Bone Basics for years but as my propensity for developing osteoporosis increases with age, I have switched to Ortho Bone knowing it is giving me the little extra my bones now need. Recommended by my natropath. 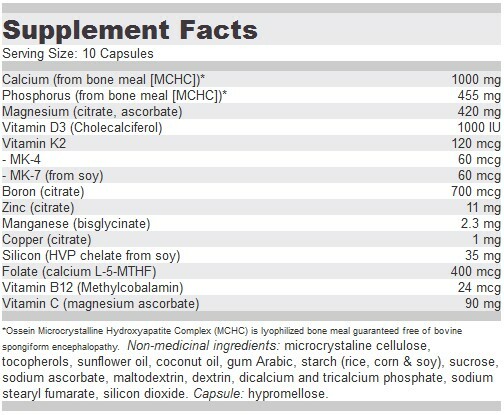 I have been taking this product for 2 years for my osteoporosis. It works well for me. I've been using this product for close to 8 months now. I originally started taking due to bone health issues. I have not been retested yet to see if this has helped improved my bone density. I do like the quality of this brand and knowing I'm getting all the calcium and magnesium delivered in a gluten free and dairy free supplement is key for me.